For the past twelve years, Dr. Zaman has been the Executive Director of Transparency International Bangladesh (TI-B), which is also the largest country chapter of TI with over 250 staff. 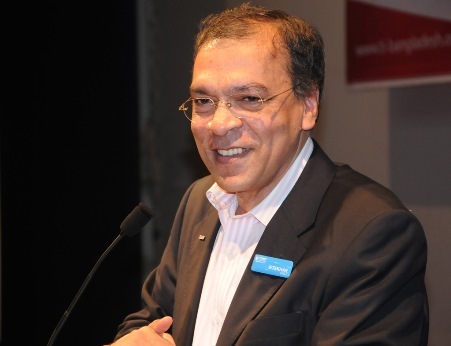 As an elected member of the International board of Directors of TI, Dr. Zaman is internationally renowned for his outstanding contributions, influence and impact in pushing for more transparency and good governance in Bangladesh. Dr. Iftekhar Zaman was instrumental in establishing the Bangladesh Water Integrity Network (BAWIN)*. We caught up with him to discuss his views on integrity, and his take on the progress that BAWIN is making in promoting integrity in water in Bangladesh. Could you tell us about the work that BAWIN is currently promoting on water integrity and good governance in the water sector of Bangladesh? A lot is happening. Besides country assessments, ongoing research, campaigns and advocacy activities, I would like to highlight one specific ongoing initiative that is generating enthusiasm: BAWIN’s partnership with the Khulna Water Supply and Sewerage Authority (KWASA). The partnership was established to promote integrity and increase transparency, accountability and participation in service delivery. The work is based on the Integrity Management Toolbox (IM Toolbox) approach, which was introduced in KWASA with the technical support of WIN and cewas. BAWIN has not only facilitated KWASA’s integrity related capacity building, but also supported KWASA to develop a strong business model and roadmap to institutionalize water integrity in their catchment area. This is the first example of such a Government and NGO partnership with integrity in the water sector in Bangladesh. When I personally met the Managing Director and other relevant senior officials of KWASA, we agreed to explore options to upscale these efforts and share experiences with peer Water Supply and Sewerage Authorities. Working on integrity with the Chittagong WASA is a next step for us. BAWIN also leads advocacy activities. To mark World Water Day 2016, we organized a National Water Rights event with eleven other organizations and delivered conclusions and recommendations including water integrity to the Water Resources Minister who pledged to bring necessary reforms in the sector. We also organized activities in schools for over 7000 students and 2000 other stakeholders (teachers, civil society) on the linkages between the Sustainable Development Goals and water integrity practices. In terms of research, we are soon going to undertake a study on the use and effectiveness of Effluent Treatment Plant (ETP) in the garments industry of Bangladesh from a water integrity perspective. How have these programmes been received so far in Bangladesh and have you noted any impact? The most important impact of BAWIN’s work in my view is that water integrity now occupies a prominent place in the water sector narratives and that there is a platform for discussion on institutionalizing water integrity in Bangladesh. Before BAWIN, TI-B advocated for promotion of better governance in the water sector in terms of transparency, accountability and participation in general. With the establishment of BAWIN, the opportunity arose to integrate these concerns under the banner of water integrity in a systematic manner. This shift as well as the introduction of practical tools such as the IM toolbox was well received by various stakeholders and has helped getting buy-in from the public sector. Where do you see further opportunities of collaboration with WIN to push for more water integrity in the sector? We have made good progress, but there is still a long way to go. We would like to generate more evidence-based data to highlight the need for further work on water integrity. Depending on available resources, we could undertake a national survey to assess the nature and extent of integrity gaps, the opportunity and cost of corruption, and to identify potential entry points of integrity interventions. We aim to widen our outreach activities at several levels: engaging greater number of people, particularly the youth; involving the media, especially in building their capacity and skills on issues related to water integrity; and exploring opportunities to work with national and international NGOs, currently mainly focused on WASH issues. Strengthening the platform for collaboration created by BAWIN will consolidate the enabling environment to raise public demand for integrity, transparency, accountability and participation in the water sector. What current and future challenges do you see to reducing corruption in this sector? Integrity has already been built into policy and institutional commitments. The National Integrity Strategy which was adopted by the Government of Bangladesh is a good example of this. The Sustainable Development Goals are reinforcing the importance of these commitments and providing new opportunities to promote integrity in the water sector. However, as in other sectors, a change in mindset does not happen overnight. There has been progress, for example with the successful implementation of integrity tools within KWASA. But, in other similar bodies personal inhibitions and resistance to change are hindering progress. An equally important issue in this regard is a lack of capacity. More capacities would allow leaders to translate professed political will into practice without fear. Although there is widespread dissatisfaction about the ill effects of corruption and poor integrity, people are generally not sufficiently ready to take a strong stance against the issues. This is primarily due to the lack of trust in the actual application of laws and effectiveness of institutions mandated with the task of corruption control. There is indeed a tendency to take corruption and governance deficit as a way of life, which constitutes a major challenge from the demand side. As you know a lot of funds are pushed into climate projects. TI-B has been successfully implementing the Climate Finance Tracking Programme. Based on your experience, where do you see the vulnerabilities in relation to water and integrity within climate projects? In parallel with BAWIN, we have successfully developed a method of hands-on tracking of governance performance of projects funded by climate finance and implemented by both the government and NGOs. While tracking, we examine transparency and accountability throughout the whole value chain of projects, from project approval through implementation procedures. We initially started this as a separate project and have more recently integrated it TI-B’s core programme. TI-B successfully raised awareness about the need for effective governance of climate financing mechanisms in government, and among experts, and CSOs as well as several other relevant international agencies. In terms of relevance of this experience for our future work under BAWIN, I would like to add that many of the climate change adaptation projects with relevance to water integrity, especially relatively large infrastructure ones, have been, and are likely to be implemented by institutions that are traditionally among those that are the most vulnerable to corruption. In the same way, water-related projects where integrity is highly needed are also the ones that are resource-intensive and most vulnerable to corruption. TI-B’s experience from the climate finance tracking programme, coupled with the platform of opportunities already created under BAWIN, may therefore enrich the content and quality of implementation of water-integrity-related projects. BAWIN was established in 2011 as an initiative of Transparency International Bangladesh (TI-B) and the Water Integrity Network (WIN). BAWIN is a multi-stakeholder network that includes civil society water sector institutions at national and subnational level as well as committed individuals. BAWIN promotes integrity in the water sector of Bangladesh through research, campaigns and advocacy to promote the engagement of various stakeholders. The members of BAWIN include the Bangladesh Water Partnership, Transparency International Bangladesh, WaterAid in Bangladesh, the NGO Forum for Drinking Water Supply and Sanitation, Bangladesh Poribesh Andolon, VOICE, Bangladesh Center for Advanced Studies, BRAC, Nagorik Uddyog, LEDERS, Institute of Water and Environment and Initiative for Right View. Facilitates change that improves content and quality of services in the water sector with particular emphasis on sustainable livelihood of all, especially the poor and disadvantaged sections of the society. The vision of BAWIN is a water sector in Bangladesh that represents the highest standards of integrity, transparency and accountability, so that people at large, especially the poor and the disadvantaged are ensured of their right of access to water for life and livelihood without being affected by governance deficit and corruption.